In Gothenburg, we built up the Unit for Environmental Economics to be a prominent centre, with four full professors and a dozen senior faculty that cover a broad range of interesting research topics from the design of policy instruments to stated preference, resource economics and experimental and behavioral approaches. 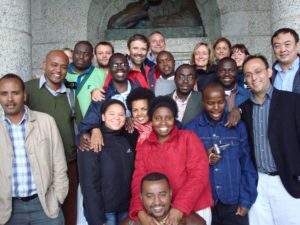 We give a unique PhD program in environmental and climate economics for students from developing countries. Some three dozen researchers have graduated with a PhD and they then returned to their countries to further build capacity. Around 200 have taken shorter courses. With Gunnar Köhlin as the main force, I helped found the Environment for Development Initiative (EfD). Its original idea was to make it easier for our PhD students to return to their native countries and do research, training and policy advice in environmental economics. The Efd has grown by leaps and bounds and now has hundreds of researchers working at research centres in a dozen developing countries. In addition to exciting research, the EfD provides a lot of hands-on policy advice and training to local policy makers.